A 13-year-old Indian schoolboy Armaan Jaffer has scored 498 runs off 490 balls in a match in Mumbai to set the new record for the highest score by a schoolboy in school cricket history. 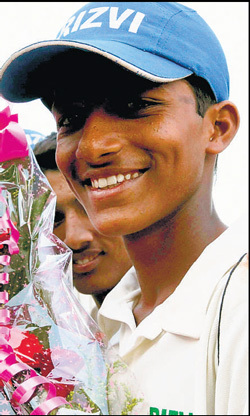 Armaan Jaffer is the nephew of Ranjit Trophy captain and former Indian opener Wasim Jaffer. This makes Mumbai amongst those cities which has brought many record breaking batsman.He achieved this feat in an under-14 Giles Shield match playing for Rizvi Springfield School against IES Raja Shivaji Vidalaya. His marathon eight and a half hour innings, which finished on Wednesday, beat the previous leading individual score of 461 in Indian school cricket, set recently by Nagpur boy Ali Zorain Khan.Incidentally the schoolboy's 498 also bettered the record set last year of 439 by Sarfraz Khan in the Harris (under 16) Shield inter-schools tournament. He in a chanceless innings he scored 77 fours and hit no sixes, just kept on playing along the ground. "I had decided not to play any aerial shots," Armaan told the Hindustan Times. "I knew as long as I occupy the crease, the runs will keep flowing. It would have been better if I had got 500, but there is no grudge." Armaan, who was 295 not out last evening, later said Sachin Tendulkar, who had created the world record school-level partnership of 664 with Vinod Kambli in the Harris Shield, was his idol. "Sachin Tendulkar is my idol. I was not looking to set records but wanted to bat as long as possible," he said after his marathon knock lasting more than eight hours. Armaan with his epic knock enabled Rizvi declare their innings at 800 for 8.